What is it really like to go for your Advanced Level Certification? Get the inside scoop below from someone who understands procrastination, panic ... and success. Also below: Meet your fellow ISTQB Certified software testers. What Happens to Those Exam Pencils? My journey to receiving the ISTQB CTAL-Full software tester certifications started when I hired a person with the ISTQB Foundation certification. Although I have certifications in ITIL and Project Management, I had never gotten a testing certification. So due to a combination of competitiveness and curiosity, I decided to get the ISTQB Foundation certificate. I didn't stop there, however. I wanted to pursue an ISTQB Advanced Level certification. Since the company that I work for allows up to two courses per year, it was time to decide what course(s) to take. I looked at the various classes related to testing or project management and decided to go for the ISTQB Test Management certification. I wanted the Test Management rather than the Test Analyst since I was enjoying the lead/manager role and needed a change from testing at this stage in my career. So began the quasi-insanity, as my co-workers, friends and relatives called it. I looked for class locations and how much it cost. I realized that an actual class would be too expensive and began looking for an on-line course, although I do not enjoy on-line training. One of my coworkers had an account with a discount bookstore, so I asked him if he could find the Test Manager book. He looked at the course and asked why I wasn't going for all three advanced certifications. I had noticed a course called CTAL-Full (which I had seen before but ignored). CTAL-Full is a 9 month course containing all three advanced level courses. I had no interest in taking the Test Analyst or Technical Test Analyst courses and only wanted the Test Manager certificate; however, I ended up taking all three courses after some encouragement. I started with the Test Analyst course. After about half a month of procrastinating, I finally buckled down and spent at least 1 - 2 hours a night and Sundays studying. There was a huge amount of material and I still have trouble remembering how to do some of the test techniques. I also performed a lot of searches on the internet to find examples for some of the specification techniques. Finally, about 1 week before the end of the 3 months, I decided to take the exam. I passed. Then it was on to the Test Manager course. The Test Manager course, although challenging, seemed a bit easier than the Test Analyst course. I had to procrastinate on starting (because that is what I do). During both courses, I probably drove my co-workers crazy since I was throwing terms and techniques at them. I finished studying for the Test Management exam a couple of weeks early, took, and passed that exam. I was feeling a little cocky, since I had completed two out of the three classes, but also worried because the Technical Test Analyst was out of my comfort zone. I started at once and sweated my way through it. Between trying to remember quality characteristics and sub-characteristics and techniques, I thought I would not only go crazy but also fail hands-down. It didn't help that the on-line course was being updated and I couldn't decide whether to do all of the modules or just the new ones. I did both and was glad of it for the background information. At one point near the end, I was talking to the person who suggested that I get all three, and he said he wouldn't take the exam given the technical content. Out of sheer stubbornness, I decided I was too far into it and scheduled the exam. I failed the practice exam by a large margin and was extremely worried about the actual exam. I did not expect to pass and was trying to decide whether I would retake it or not. Luckily for all involved, I passed and didn't have to make a decision about retaking the course or the exam. The question always comes up: "Was getting the Advanced Level Certifications worth it?" Although it was a long 7 or 8 months to receive the CTAL-Full certification, I believe it was. It formalized techniques I was using on the job but may not have known the reasoning behind them. It also provided additional management techniques for Agile projects and various methods to present information to both managers and employees. I also learned from an intellectual level how to set up an automation test program which I am currently attempting to implement. Do not take an on-line course. I found that the interaction that comes with an instructor led course helps me learn material better. I did the on-line course but spent a lot of time being frustrated, especially with the TTA certification due to the course updates and my lack of background with automation. If you are not currently working in any of the areas, such as TTA, review all of the material ahead of time. If you do that, the course might not seem quite as daunting. It is very difficult if you are working full time and taking the on-line or studying on your own after work. Make sure to give yourself some time off, especially after taking the exam. I couldn't do the on-line course on Saturdays, it allowed me to review material. I sometimes found it easier to read rather than listening to the on-line material. my procrastination and panic time. Build your software testing skills and career by attending the ASTQB Conference. Who should be at the ASTQB Conference? You. Everyone involved in software testing, QA, security and application development, from tester to manager to CIO, should be in Washington DC September 14-16 for the ASTQB Software Testing Conference. You'll love meeting other ISTQB Certified Software Testers! The tutorials, keynotes, and breakout sessions will help you to improve your software quality and security. But the ASTQB Conference is more than just classes. You will meet and build connections with your fellow ISTQB Certified testers from many industries. This is your chance to build your career network while you develop your software testing and security expertise. See 3 more reasons the ASTQB Conference can help your career. We have introduced a new and easy way to access the terms in the ISTQB Glossary. This new application allows you to query on individual terms as well as to get reports based on syllabus usage. For example, if you are studying for an Advanced Test Analyst exam, you can get a report on all the terms in the ATA syllabus, just the keywords, or a report that shows all the terms in the Foundation and ATA syllabi. We hope you find this tool helpful when checking on definitions or studying for exams. The new glossary can be accessed at astqb.org/glossary. For software testers, ISTQB Certification demonstrates your knowledge and provides a professional pathway. For companies and test managers, it can help to reduce costs and speed delivery. You can continue your software testing education with free ASTQB software testing webinars. You can prove your knowledge by using the ISTQB Certified Tester logo on your personal website, resume, business card, blog, Facebook page, and Google + page. 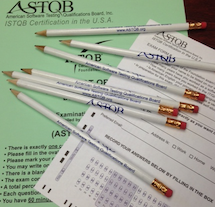 Congratulations on making the brilliant choice to become ISTQB Certified through ASTQB! Send your colleagues this list of reasons they should be ISTQB Certified, too! ALP International (ALPI): Let ALPI train & certify and your test team in 2015 and SAVE with multi-person discounts at any of our 3 locations: Bethesda, MD, Denver, CO, or Virtual Live. Choose ISTQB Certification Training: Foundation Level & Agile Tester, Advanced Test Analyst & Test Manager. Or choose Test Tool Training from HP (QTP, UFT, LR, QC) and Microsoft (MTM, CodedUI, LoadTest). Contact our Training & Education team at training@alpi.com or by calling (301) 654-9200 ext. 404. RBCS: RBCS' ISTQB Foundation Level Extension Agile Tester E-Learning is HOT this summer! Receive three months of 24/7 online access to the course, downloadable materials with no expiration, and the option to purchase hard copy materials and an exam voucher. Enter the code DOGDAYS15 in the promo code field in your cart to receive a 15% discount off of the list price of $599. Visit the RBCS store today! Offer expires August 31, 2015. Rice Consulting Services: Rice Consulting Services is offering a special bonus on ISTQB Foundation Level e-learning for teams of five people. Enroll five or more people in CTFL e-learning courses and get one extra registration free, including exams. Use code "ISTQB6" at www.mysoftwaretesting.com when purchasing the 5-person enrollment version. Offer expires on July 31, 2015. SQE Training: Continue your journey down the ISTQB® certification path. Receive special savings on Agile Tester Extension and Advanced Level Certification courses through SQE Training. Register here by August 31 for a public certification class with promo code 250QB and save $250. Want to train your team? Groups save even more! Email sfender@sqe.com for a custom group quote. Restrictions apply, only valid on new registrations. I just wanted you to know that the box of pencils that you donated for Lake Magdalene UMC is going to be traveling with them on their high school mission trip to the Dominican Republic this summer. One of the items the mission team requested was pencils for the children, so I told them we had a whole donated box that she could bring. Of course, we hope you want to keep the pencil as a souvenir, you've earned it! We would love to meet you in person! If you are attending any of these shows, stop by the ASTQB booth, say hello to the ASTQB staff and volunteers, and learn about the latest ISTQB Certifications and benefits. Also keep in mind that many of these shows offer public ISTQB Certification exams, so be sure to check with the organizers for the date/time of the exam you wish to take.